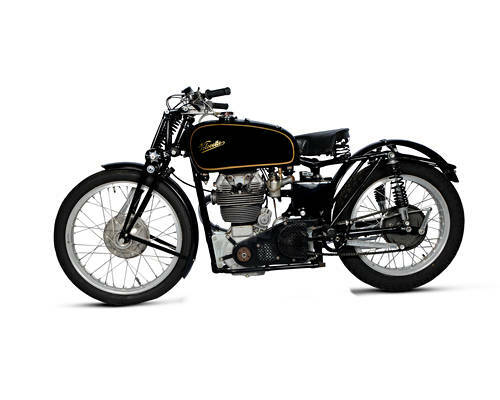 Velocette was a small family owned motorcycle manufacture in which the members of the board were members of the family, and they raced their motorcycles. 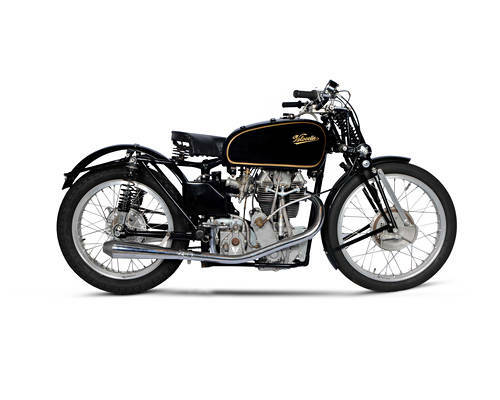 The KTT was their Over Head Kamshaft race bike that was first developed in 1925 by brothers Percy and Eugene Goodman to race in the Isle of Man TT. They won it with Works racer Alec Bennett at the wheel in 1926. The firm continued to develop the KTT for the Works team and privateers until 1950 with the final Mk VIII. Bonham offered a couple of different KTT up for auction in the coming weeks in both Stafford England and Melbourne Australia. 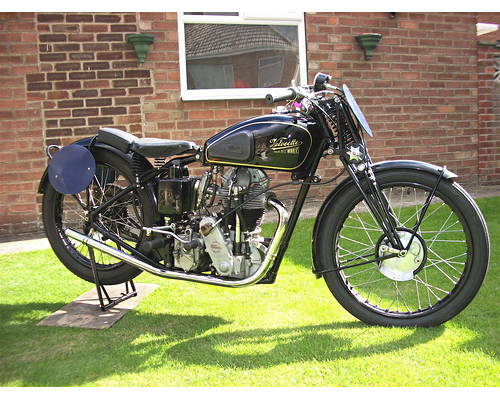 According to the known history, this Velocette special was raced by someone named Hiscock in the 1950s with some success. The next owner was Don Daly, a noted engine builder, before the Velo passed to Peter Pack, who fully rebuilt the bike in the period 1983-1984 then raced it for half a season in 1984. 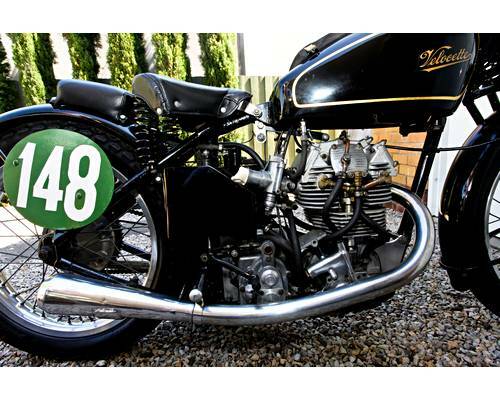 The current owner, a collector and bike enthusiast from Melbourne, purchased the Velocette in 1985 and after racing it once at Winton, called it a day and retired the bike to his garage until now. Drained and properly stored, the Velo has been regularly turned over but would require re-commissioning before returning to the track. The ignition has been changed from magneto to battery/coil (original magneto base retained) and comes with some spares, including a high compression piston and cylinder. 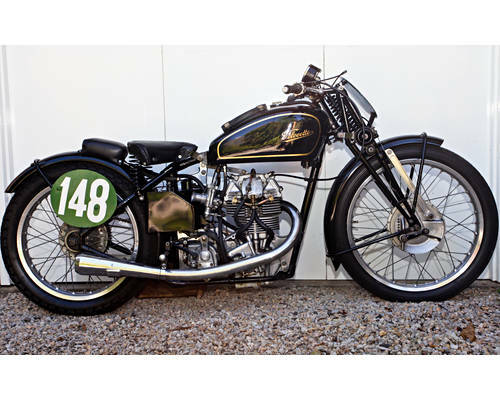 Not only was the KTT a formidable motorcycle, winning the 1949 and 1950 350cc World Championships, it was also a test bed. 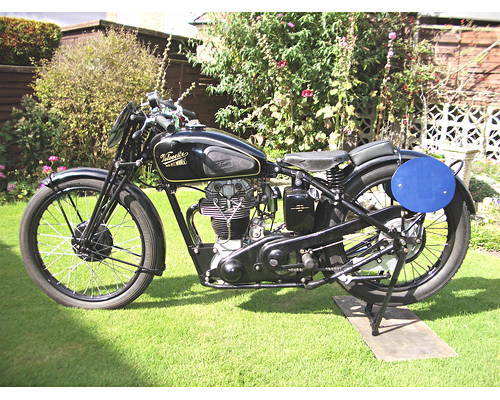 Something in which every motorcyclist today takes for granted was first seen on a KTT in 1928. The positive stop gear change moved the hand-shift mechanism and improved engine management, but also control since you no longer would have to remove your hands from the handlebars. Supplied new by Deansgate Mart,Manchester And listed in KTT registers, this is a genuine MkV, albeit one that is believed to have had its crankcases replaced at some time, resulting in the loss of the original number stamping. The vendor has resisted the temptation to re-stamp the number. Modifications include the fitting of a KSS MkII aluminium cylinder head – a common upgrade in period (see above); Walter Handley, amongst others, raced KTTs modified in this way. In addition, the engine is fitted with a larger inlet valve, a Mark VIII piston, a 17/8 cam, new Carrillo con-rod and a magneto recently overhauled by Dave Lindsley. The forks are of the correct strutted type and the machine is fitted with a Smiths 0-80mph speedometer and a small bore exhaust. The 348cc (and the smaller 250cc) engine was controlled by a shaft and bevel single or double over head cam engine that would develop 20bhp or more depending on the tuner. This could push the light weight rigid, or later sprung frame, over 100mph qualifying for a Gold Star at the Brooklands race track prior to WWII. There was even an experimental supercharged KTT called Wiffling Clara in 1931, but because of the trouble inherent in pressurizing a single cylinder, was never raced in anger. The second of two KTTs in the Late Leo Andrews’ Collection, this particular machine is believed to have been built in 1948. The bike was carefully restored by Leo over several years and ridden on numerous occasions until his passing. Included are the original rear shock absorbers and handle-bar clamps.